Summary: I enjoyed this delightful short and easy walk as a late afternoon and early evening filler during a three day Lake District trip after finishing a Borrowdale walk earlier than I had expected. I am so glad I did, it was an unexpected joy throughout the two hours it took me to amble around it. 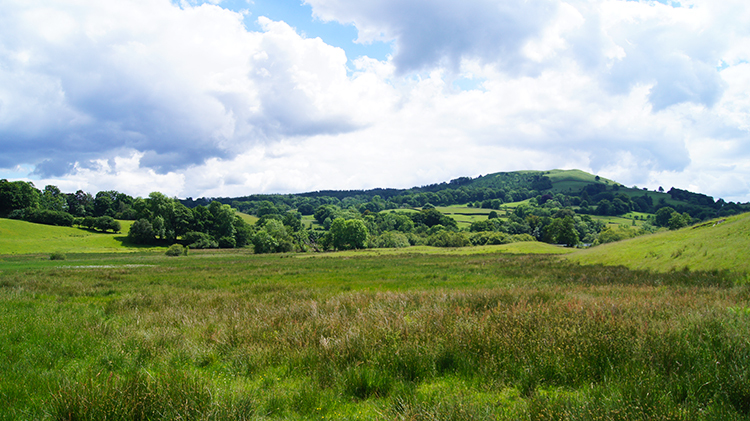 The first part of the walk is a lovely stroll along a quiet path to Blelham Tarn which is set the wonderful surrounding of lush green meadowland. There are low fells to admire all around and beyond the tarn are excellent views of Lake District mountains including the Helvellyn range. Find a way to sit beside the tarn. I did. Afterwards the walk climbs all of 40 metres to High Tock How and then gently descends past Hole House to cross beautiful flower meadows. In high summer the fields are a bright sea of yellow and green. 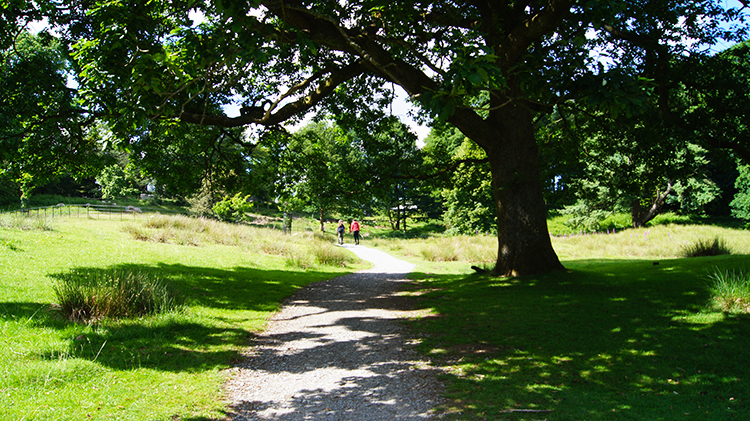 The second part of the walk takes in a woodland trail and then a stroll along the west shore of Windermere. Rest here or play a while as others were as I walked along. 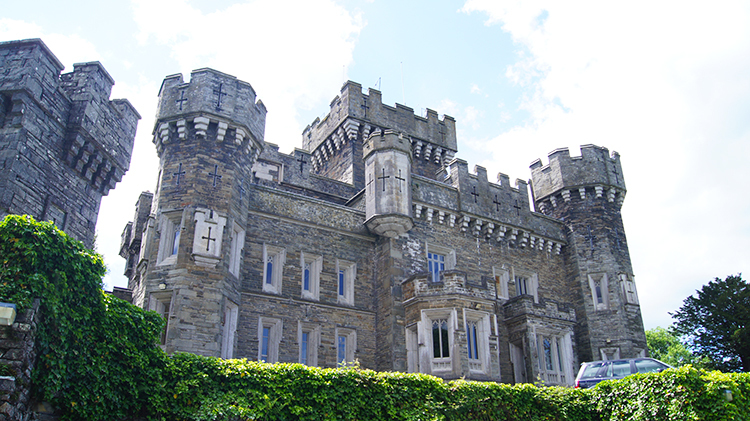 Finally the walk climbs from the shores of Windermere to Wray Castle, a neo-gothic building with fairytale turrets. After visiting the castle it is a short walk along the access lane back to the start, one I did full of smiles. I set off from the car parking area near to the access lane to Wray Castle on the Low Wray to High Wray road and walked down the quiet minor road towards Low Wray Bridge. (Note the car parking area which is a kind of unmade lay-by was easy to park in despite it being late afternoon in high summer. If busy alternative car parking is available in the castle grounds) As I wandered down the lane Swallows, or maybe Swifts, flew in their graceful aerobatics overhead. They were enjoying the lovely summer afternoon as much as I was. 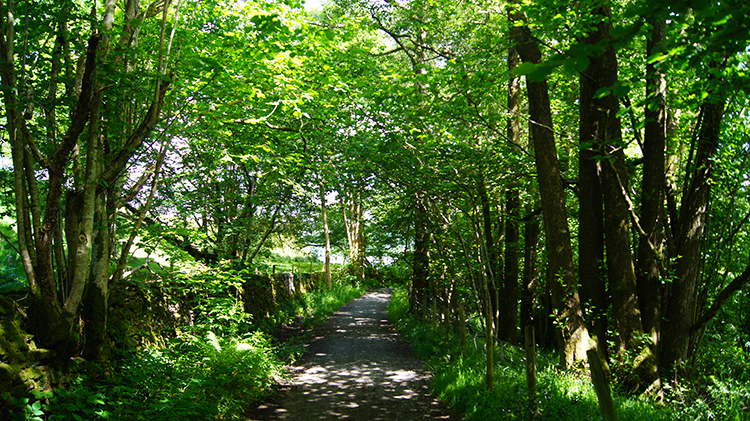 As I continued down the lane my eyes were drawn to my left to find the path I would follow to Blelham Tarn. 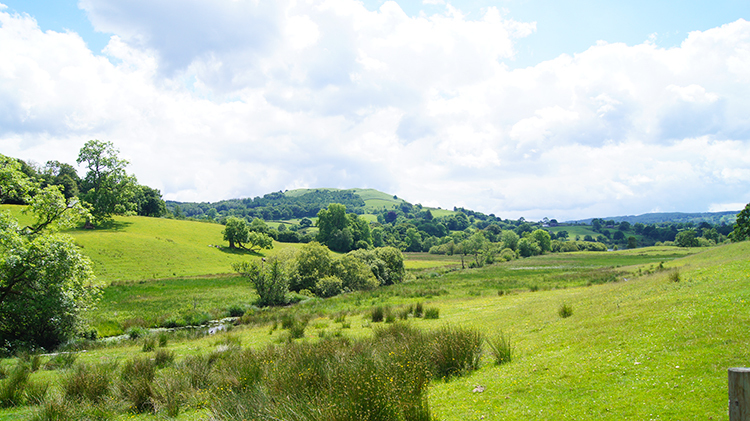 Blelham Beck flowed peacefully, cutting a straight line through a deep green pasture. 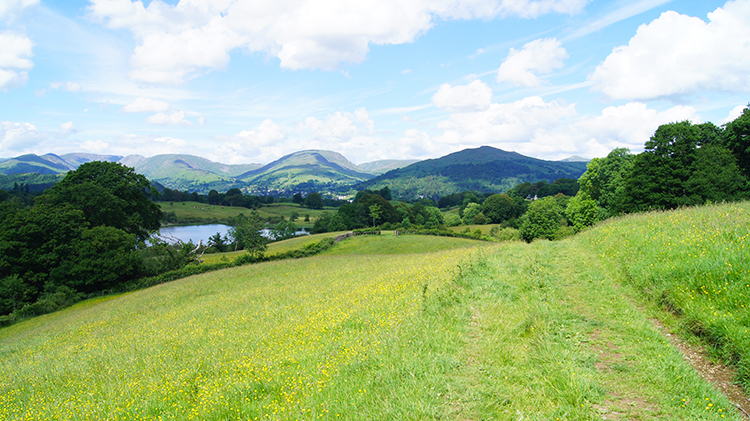 Beyond, tree covered the low fells near the hamlet of Outgate seemed to shimmer in the heat of the day. I left the road and passed through a gate to follow a well made and recently laid path across the low pasture land towards a small stretch of woodland which would lead me directly to Blelham Tarn. As I strolled along the path a couple of walkers heading in the opposite direction stopped momentarily to chat with me on the merits of the day and the beauty of the surroundings. It was a short and pleasant interlude. Then soon after I had resumed a power walker, also going in the opposite direction to me passed. Despite my utterance of "Good afternoon" I received no reply. Ah well, he may have been puffed out. From the short stretch of woodland I arrived near the south west tip of Blelham Tarn. The waterside was about 25 metres away from the path and over boggy ground but by was compelled to reach waterside. I hopped onto the high and dry tufts of grasses, a balancing act, to get close to the waterside. I reached a point near the edge of the tarn and clung on to waterside hawthorns to keep my balance and look over the tarn. It was a serene scene. Dragonflies skimmed over the water, hovered a while and then darted away again before starting another hover. They are magical to watch. I had to be content with the Dragonflies. Despite my cover wildfowl were not to be seen. They much have been out for the afternoon. I shuffled around from my precarious perch beside the tarn and hop stepped carefully back to the hard path. I did not fancy getting my feet wet by sinking into the mire and goodness I managed it well. Back on terra firma I followed the path on my longest and hardest climb of the walk, a steep couple of minutes climbing for all of forty metres ascent to the road at High Tock How. 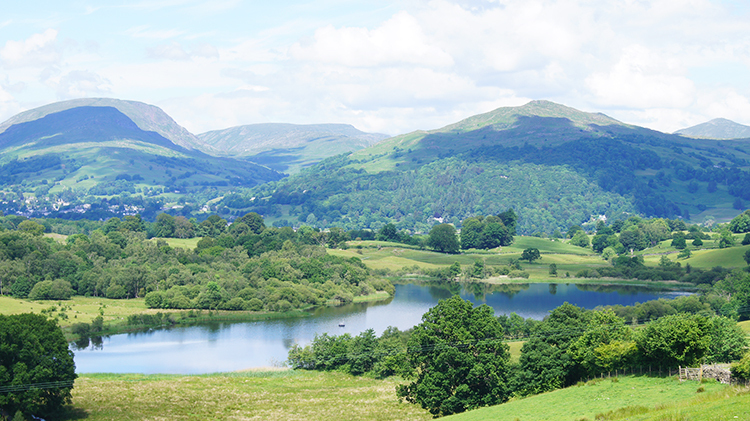 The viewpoint I gained from the effort was a great one, straight across Blelham Tarn to Ambleside and the Eastern Fells including Loughrigg Fell and Wansfell in the foreground and the west facing slopes of the Helvellyn massif too. The land near Blelham Tarn itself was a perfect patchwork of darker greens of trees and copses and lighter greens of pasture and meadow. Spots of yellow showed in the grass too and they came into more prominence after I had walked down a short stretch of road to Hole House and beyond to cross fields full of bright Buttercups. The fields I walked through were absolutely divine. 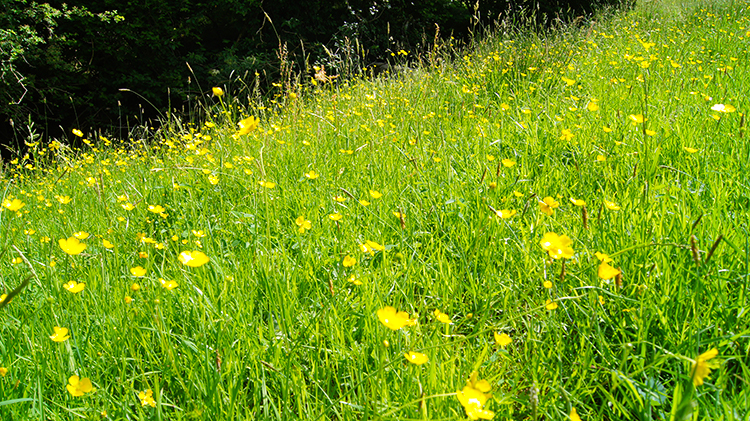 It was mid June, exactly one week before the longest day and the Buttercups were in their best form. They had responded to the warm sunshine and stood up, fully open to display their bright yellow golden colour and to compliment the gorgeous summer scent of fresh meadow grass. I regressed into my early days when such wildflower meadows were common in my native North Yorkshire. Before the meadow fields were plundered with herbicides and hedgerows ripped out from profit maximisation. This was my childhood idyll again, maintained gorgeousness such as it still is in higher altitude dales like Swaledale and Upper Wharfedale where the wildflower destroyers have not reached. I could have rolled in the hay but relented, instead to just stand and look all around. And to stop for a break, enjoying some refreshment while sitting on a path side raised hump and looking at the flowers. 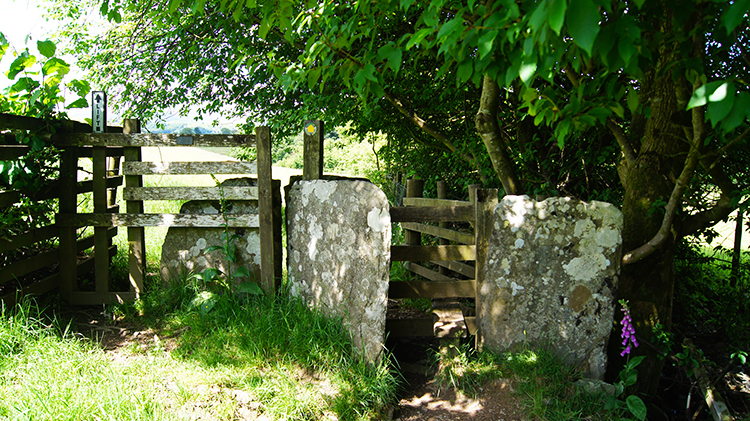 After my break I reluctantly resumed my walk, on the course of it making my way through a picturesque pinch stile and gate. All was good with my day. Just twenty fours earlier I had arrived in the Lake District to the clarion of thunder and heavy rain. I could have done this walk then had the conditions being favourable. I was now glad I did not. Then earlier this day I had woken to sunshine and after the earliest breakfast possible I had climbed to High Doat and Castle Crag in Borrowdale. That was a superb sun blessed walk and now I was on another sunny spectacular. 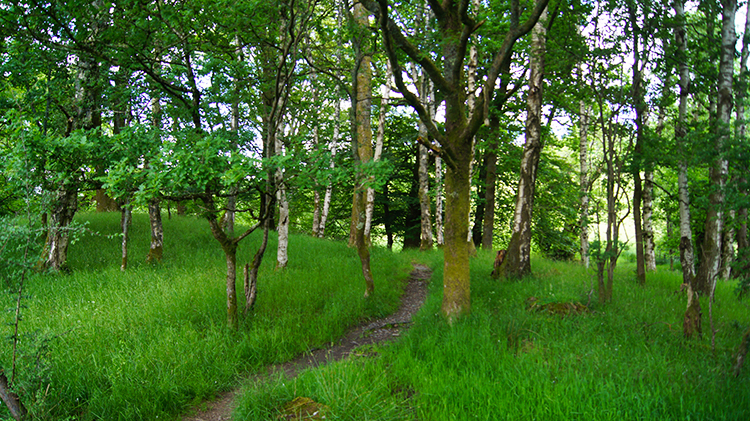 After my thrill of Buttercup meadows I thrilled in the continued walk through woodland copse and then on a woodside trail towards the shore of Windermere. All through my tree featured stage of the walk speckles of warm sunlight washed over my face. I loved it throughout this darkest stage until I emerged from the dappled light to arrive at a waterside scene. A sign at the junction of paths presented plenty of options. 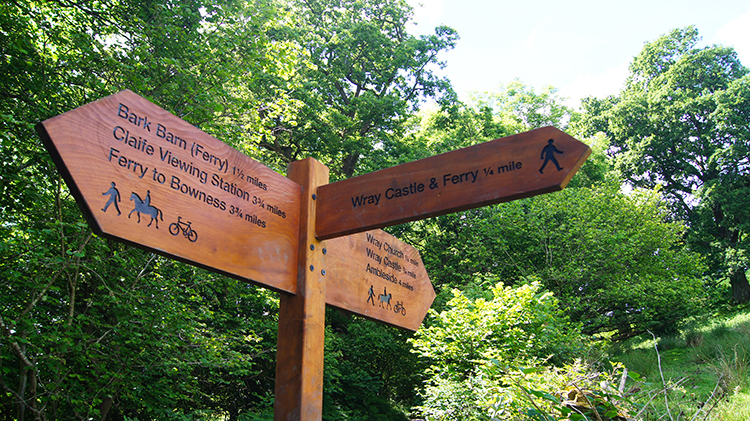 I could have turned right and followed the path south along the shore of Windermere to Bark Barn Ferry at one and a half miles or Claife Station Viewing Point and Ferry at almost four miles. Or I could turn left and follow the path north along the shore of Windermere to either Wray Church, Wray Castle or Ambleside. 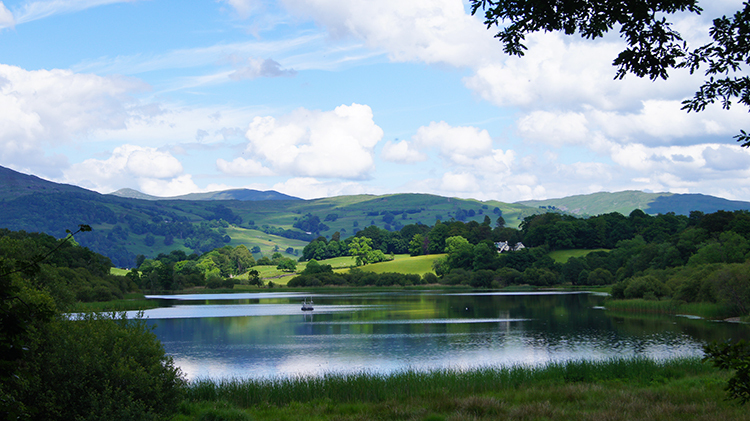 It was the middle choice for me which would take me away from the Lake District's premier lake but first I had a short spell of walking to enjoy along its shoreline. 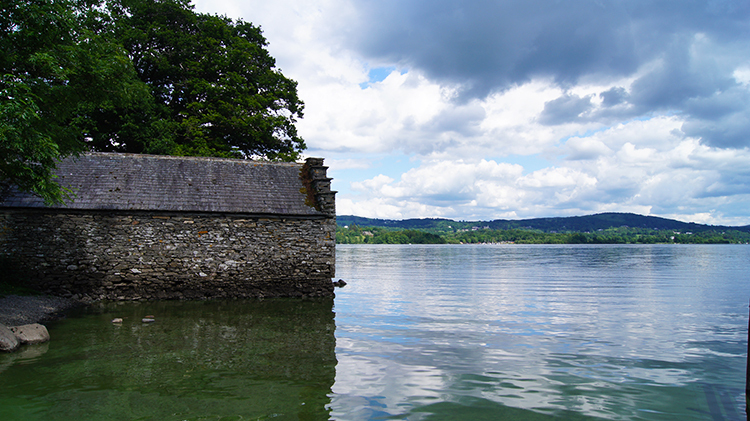 The first bit of it was in quiet solitude as I looked across the lake and to a small well maintained waterside barn which probably housed pleasure boats belonging to the castle. I could not get around to see inside. I walked northwards to the far side of the barn and there were the people. lots of them. 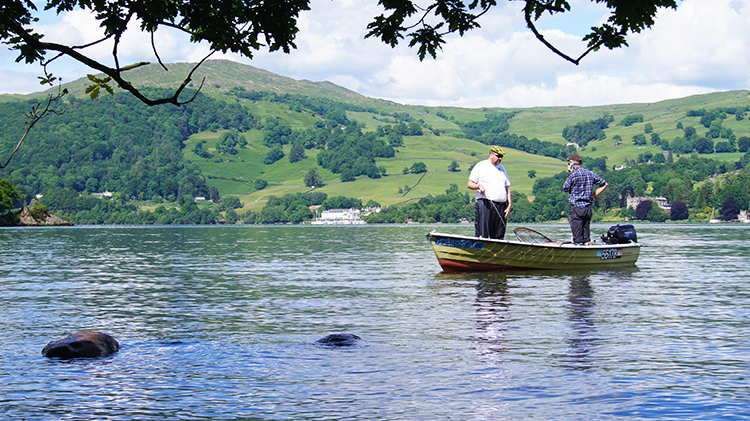 First I looked out to the lake where a couple of chaps in a boat appeared forlorn. While one fished the other was on a mobile and I imagined a cartoon caption which goes "Where are the fish" exclaims one chap on Windermere after purchasing a prime angling spot for the day. Nothing was biting for them, not while I watched anyway. By turning my head slightly left I saw a couple in a bright blue Kayak. They were more active, paddling away. On and around the shingle beach were family groups. Parents were lazing in deck chairs while young ones were paddling in the water. So were the family pets. And who could blame them, it was a hot day. 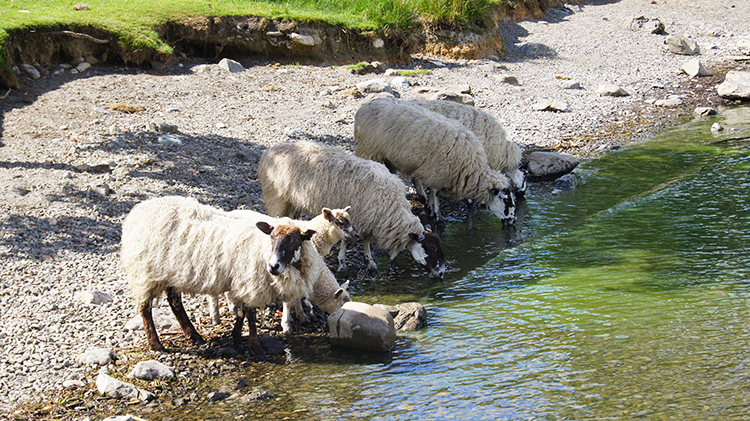 Sheep were on the shore too. The type who are used to people as they continued about their business as I walked closely by. Even they were paddling in the water and drinking from it too. It was a peaceful scene throughout with even the young ones playing quietly. I stood and watched the stirrings just as the pleasure seekers were. Then the roar came, an instant one which I knew could only mean one thing. Jets were flying low nearby and they came straight across the lake flying from south to north directly in front of my eyes. There were two of them. Their flying over the lake reminded me of the time I was on the lake in a motorboat. My wife Lil was teaching my friend Joe to water ski on the lake in the days before water-skiing was banned. 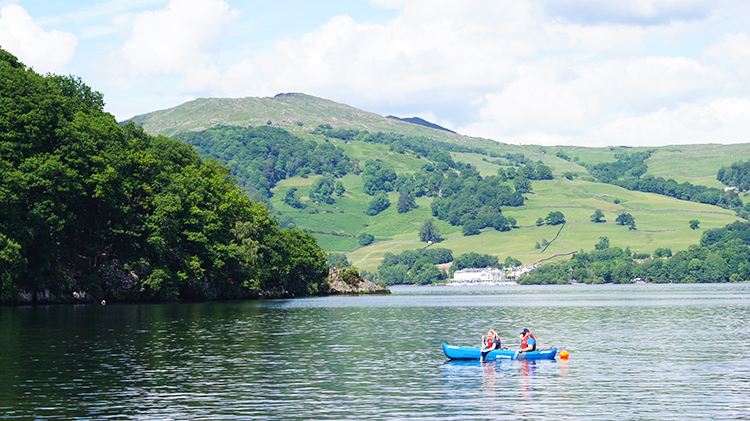 We were in the middle of the lake and stationery while Joe bobbled up and down in his wet suit after falling off the skis for the umpteenth time. As he bobbled with face directly facing to sky a jet flying really low passed right over him. I cannot say what he shouted out here. I will translate it to HALLELUYA which is much more acceptable. It was delightful by the lakeside, it really was. I could have stayed for much longer than I did but I still had things to do which included an exploration of the inside of the castle. Being a member of the National Trust I just had to visit. 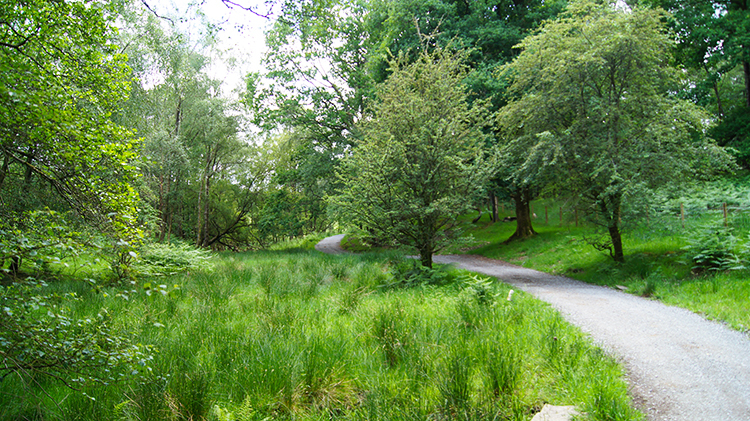 I followed the very pretty parkland walk from the shore of Windermere up to the castle. I arrived by the quiet east side of the much turreted structure. Pure Camelot I thought and indeed Wray Castle was never designed for defence or to withstand siege. It is pretty and intended to be so, built as late as 1840 for a retired Liverpudlian surgeon called James Dawson. Now that is some folly. The setting is stunning, the castle is romantic. After my wander of the interior of Wray Castle, which I thoroughly enjoyed, I resumed my walk which was a short stroll along the access lane of the castle to my finish near the entrance lodge. 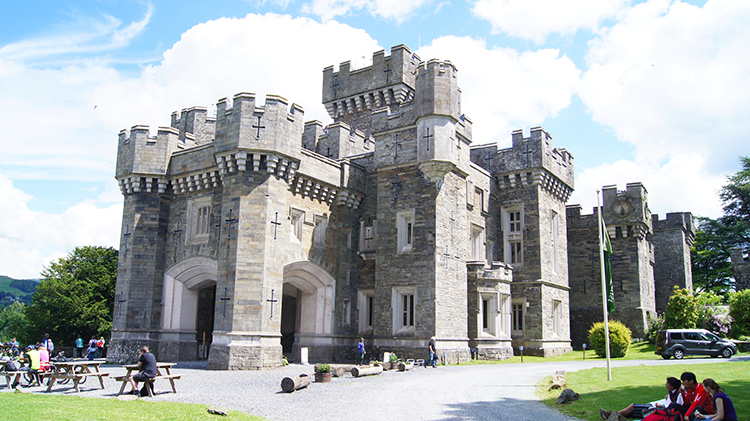 It was near my emergence from the inside of Wray Castle, on the west side, where most of the people were. There were many groups sat at tables taking picnics and there were lots more sat on the lawns surrounding the castle also taking picnics. 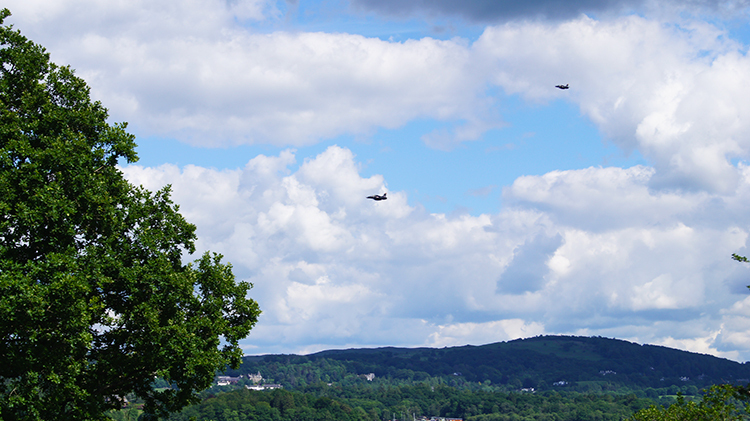 It was a perfect summer evening and many were enjoying themselves in the calming surroundings of Wray Castle. I was so glad I had visited too. I finished my gorgeous short walk by looking to my right as I wandered down the access lane. 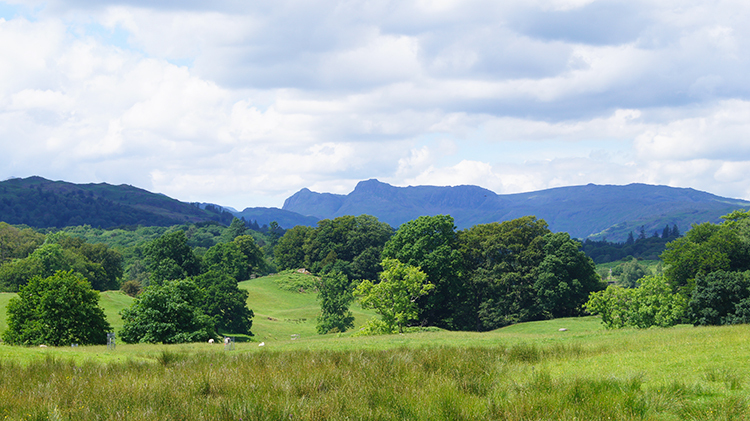 The distinctive profile of the Langdale Pikes presented themselves. It was a fitting finale.